Cissy 1958 21" Queen NO. 2281 by Madame Alexander takes a moment with her "Prince" by Chad Valley and "Puppy" by Steiff. There are royals here, there and everywhere just now - some are getting married, some are having birthdays, and some are having babies. 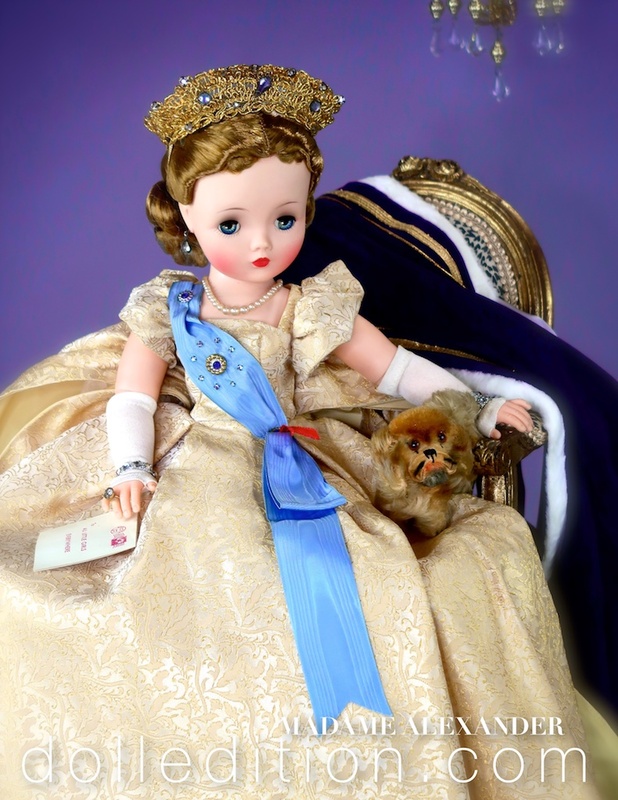 My own royal experience is limited to some of the glorious dolls representing royalty by Madame Alexander. There was also my last year of summer camp when the Peppy Puppy tongue twister was all the rage with a group of young campers who adopted it for their hiking trails. We challenged ourselves during the summer to hike to the next level. One of the ways to block out the discomfort of heat and soreness was to chant the Peppy Puppy tongue twister, along with knock-knock jokes, which kept us laughing and giggling at ourselves. I've adapted the Peppy Puppy for a new user and sent it on to a dear friend who is having some unique challenges of her own. Regardless how far she can get, I'm sure she'll help the Princess in her own way. For anyone not familiar with the Peppy Puppy, hopefully, you'll find the time and good cheer to make it work somehow for you or someone you know. Cissy 1958 21" Queen NO. 2281 by Madame Alexander wearing a court gown of gold brocade. Her tiara is sparkling with gems. Long white gloves, glittering sewels. She is regal and romantic. Puppy and the Princess reflect on the events at the palace.